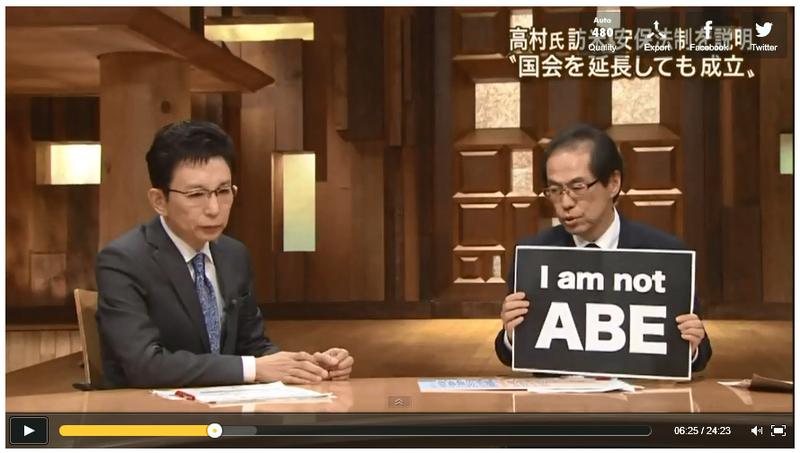 Shigeaki Koga (right), a former government bureaucrat critical of Prime Minister Shinzo Abe, holds up a sign in this screenshot of his appearance on a news program aired by TV Asahi on Friday. 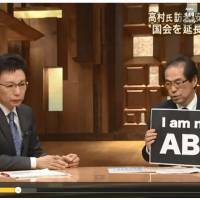 A surprise show of protest by a former bureaucrat against Prime Minister Shinzo Abe during a live news program Friday night is drawing flak from both the government and broadcaster TV Asahi. Sitting next to newscaster Ichiro Furutachi, Koga at one point during the program whipped out a piece of paper on which the phrase “I am not ABE” was written, displaying it to millions of viewers. But he began by telling the audience that he would be ousted from the show starting in April due to pressure from the TV station’s management. “Before I start, I would like to mention this will be my last appearance on the show. That’s what chairman of TV Asahi wanted,” Koga said, adding that a production company co-founded by Furutachi also played a role in ousting him from the position. “I have been supported by lots of people, but I have also faced a severe backlash from the sides of Chief Cabinet Secretary (Yoshihide) Suga and the government,” Koga said, referring to his tenure during the show. Suga told reporters Monday morning that Koga’s accusation was “completely unfounded” and that while he appreciates the importance of freedom of expression, he found the remarks “extremely inappropriate” for somebody appearing as a commentator on a news program. When contacted by The Japan Times, TV Asahi said Monday that it was not pressured by any external forces to pull Koga from the show. “We find it disappointing that Mr. Koga expressed his personal views and suddenly made comments that were not based on facts” during the news program, the broadcaster said in a statement. As the show progressed, Koga ramped up his anti-Abe rhetoric. He criticized the way the prime minister has been peddling nuclear technology worldwide in pursuit of profit for Japanese firms. He also lamented the administration’s decision to effectively scrap the nation’s longstanding weapons-export ban last year. Instead, Koga said Japan should explore the use of renewable energy and pursue pacifism. “This is not just me criticizing Abe, but I hope my actions will encourage Japanese people to think how they want to live their lives,” Koga said as he concluded his speech.